It was a dark and windy evening at the Falcon Structures facility, but Tyson and his handler, David Deason, deputy for the Travis County sheriff’s department, were undeterred. 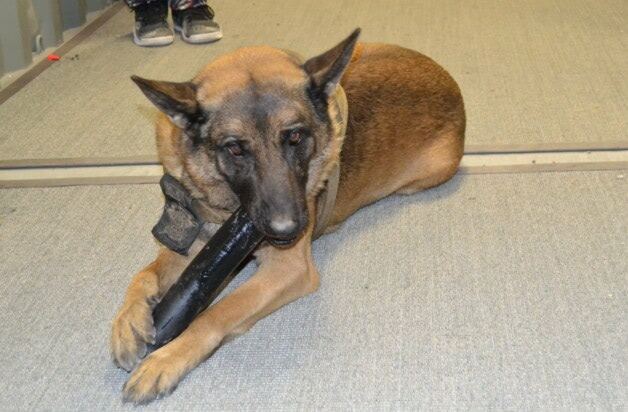 Tyson, a Belgian Malinois, pulled Deason through the shipping containers with a single-minded drive to find his target: a small sample of narcotics that the officers had placed earlier. There are plenty of places to hide, but Tyson can smell people and narcotics a quarter to a half a mile away. Once Tyson catches the scent, even 16-gauge corten steel can’t keep him off the track. Deason and Tyson work together to track down people and narcotics. Because we’re constantly stacking and rearranging new inventory, the Falcon Structures facility offers a dynamic and multi-level environment to put police dog noses to the test. When the Sheriff’s department asked if they could borrow our facility for K-9 training, we were happy to oblige. The dogs that occasionally train at Falcon use their remarkable sense of smell to assist police searches. For example, Tyson may be sniffing out cocaine on a drug raid one day, and then tracking down a missing child the next. Unlike our dogs at home, Tyson doesn’t hesitate when Deason gives him commands – which, by the way, are in Dutch. Like many police dogs, Tyson was carefully bred for courage and a drive to perform and received basic training in Europe. Not many dogs are cut out for police work, but those that are cost around $10,000. It’s a hefty price tag, but these dogs more than pay for themselves when they lead officers straight to contraband. Tyson’s air scenting is especially helpful when the police are in a hurry. Running straight to a source upwind is much faster than following a winding path one footprint at time, but there is a time and place for more detail-oriented work. Dogs that exclusively track, often German shepherds, will stop and point out dropped items, allowing police to collect evidence along the way. “Belgian Malinois, like Tyson, are like your Porsche: they just want to go all the time. The German shepherd is like your Cadillac: smooth moves, nice and easy. They’re more methodical,” said Deason. Highly motivated to perform, Tyson gets his chew toy as a reward for good work. Tyson is also trained in apprehension and will bite on command, but he’s still an easy-going dog. You can give him a scratch as chews on his favorite toy, a thick rubber tube. You wouldn’t know it while he’s pulling Deason through the shipping containers, but Tyson is getting close to retirement at 9 years old. “When he retires, he’ll get to stay home and just be a dog,” said Deason. 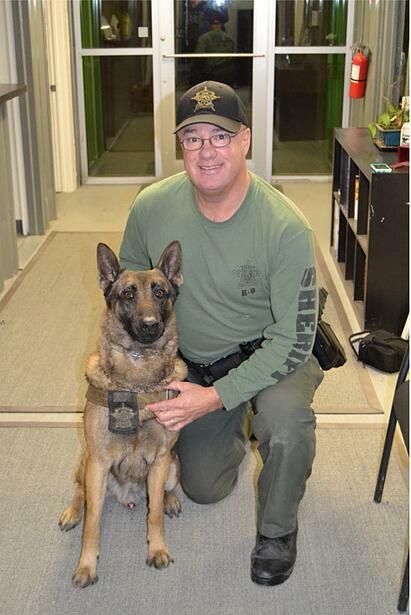 At Falcon, we appreciate the work that the Sheriff’s department does to keep Travis county safe, and we hope that when Tyson does retire he enjoys many restful years as a loving pet. Another use of shipping containers on the books: A K-9 Conex training facility. Did you know that Falcon creates modular emergency responder facilities? Learn more.